Available colors: White, Beige, Black, Red, Purple, Lightblue, Yellow, Blue, Green, Pink, Orange. ** Size: 26.8″(68 cm) length, 37.8″ (96 cm) in diameter. ** Manual open and close. 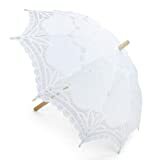 ** Can’t be used in rain.